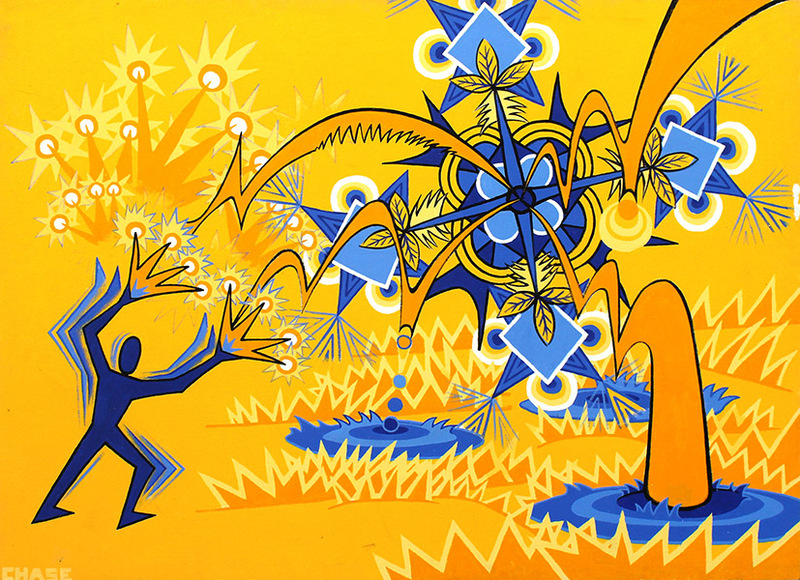 BLUE ENERGY MAN acrylic, 60" x 72"
When I was a really young child I drew the moon and the stars on a blue postcard. Since then I have created images that try to apprehend something larger and intangible. Life often seems absurd and I find this to be both funny and shocking. I am attracted to extreme events, to disruptive moments, to explosive outcomes. I am often astounded by what goes wrong between people when seen as “the other.” I worry that religion contributes to this more than it helps to fix it. So as people live lives of opportunity or survive lives of deprivation, big questions leap out that demand some answers. “Why are we here? What does life mean? What is our responsibility?” Art is a great way to ask and to seek answers to these questions. In many of my pieces I try to pose dilemmas for the viewer to solve. I ask “Can you believe that this happens?” and dare the bystander to come up with an answer. My “art with a social conscience” begins with “Who am I?” and aims to answer “Who are we?” Each moment of human interaction, whether simple and intimate, or catastrophic or miraculous, puts our belief in the sacredness of life to the test. When it counts as it may, each moment is a kind of ecstatic dance, a chance to feel something, to love something, to celebrate life in all its colors!